As winter really sets in, don’t forget to help keep your cats warm and safe. Help your cats remain healthy during the winter by following these simple guidelines. The winter season can be harsh on our cats, so that you should fortify their coat. Supplementing their diet with essential fatty acids that will cause the coat to grow in a bit thicker for the cold months. Vegetable oils such as canola oil, safflower oil, soybean oil, fish oils and butter are high in these fatty acids. They can be added to the food. Cats do have a preference for the fish oils. Increase your cat’s food intake, particularly protein, to keep her fur thick and healthy through the winter months. So as long as your cat doesn’t have a weight problem, give her extra food and treats during the winter months to help her keep warm. Give your cat vitamins E and B-complex that will strengthen the tissues and make cats more resistant to cold. But you should be careful, because providing additional vitamins can actually cause imbalances in her diet and medical problems. Be particularly gentle with elderly and arthritic cats during the winter. The cold can leave their joints extremely stiff and tender, and they may become more awkward than usual. Stay directly below these cats when they are climbing stairs or jumping onto furniture. Consider modifying their environment to make it easier for them to get around. Make sure they have a thick, soft bed in a warm room for the chilly nights. Make sure your cat has a warm place to sleep, far away from all outside drafts and preferably off the floor – such as a basket or a cardboard box with a warm blanket in it. 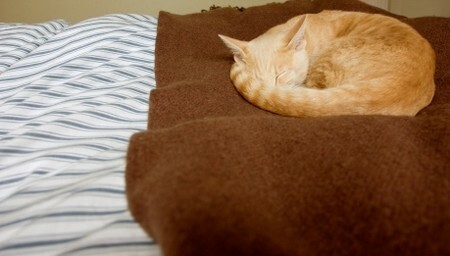 If your cat normally sleeps on the floor, provide her with a warm and comfortable mat or a bed. Keep fireplaces screened. Cats luxuriate in its warmth. However, if they lie too close to the fire, they are in danger of hot cinders or sparks. Fireplace heat also contributes to dry skin. Fumes from the fireplace may cause respiratory problems in some cats. If you have to take your cat to the vet, put a hot water bottle in the carrier. You can also put the cat’s bed in the dryer for a few minutes before putting into the carrier. A cover or towel on the carrier is good for blocking draughts.